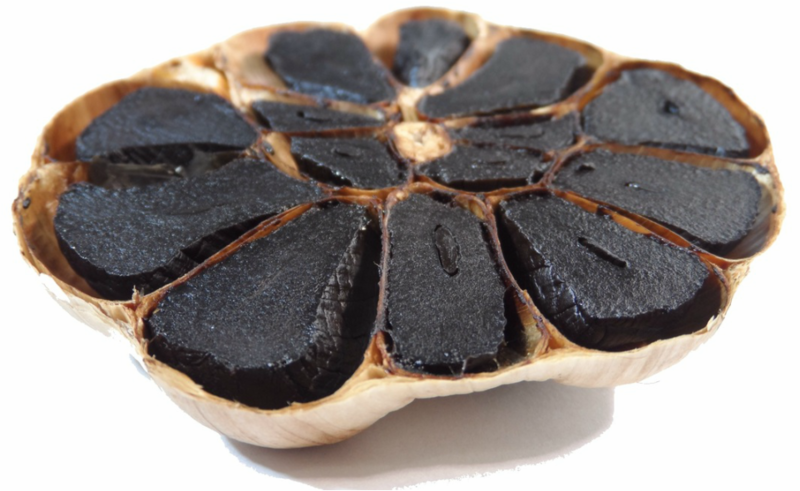 Black garlic is enjoying a rise in popularity in gastronomic circles and the alternative medicine field. Introduced to the health and food markets about five years ago by the Koreans, garlic becomes "black garlic" through a month long process of fermentation under strictly controlled heat and humidity. The month long fermentation process in creating black garlic contributes to creating a kind of super garlic. The compound S-allylcysteine, a natural component of fresh garlic and a derivative of the amino acid cysteine, was found in much greater concentrations in black garlic and is thought to help lower cholesterol and decrease the risk of cancer. White garlic contains antimicrobial, antibiotic and antifungal agents in its active ingredient, allicin. In black garlic, S-allylcysteine assists with the absorption of allicin, helping it metabolize more easily, which could offer boosted protection against infections. Garlic is also high in antioxidants. Black garlic has been found to have twice the antioxidant properties of conventional garlic. Antioxidants protect the cells from disease and are thought to slow down the aging process. Because black garlic is so potent, the heightened levels of antioxidants offering protection from free radical damage make it an ideal food for thwarting chronic disease. Free radicals damage cells leading to heart disease, Alzheimer's, circulatory problems, rheumatoid arthritis and other chronic diseases. The fermentation that produces black garlic reduces the pungent odor and strong flavor, making it more palatable and appealing to some people. Conventional garlic, even in freeze-dried capsules, emits a strong garlic odor that permeates the skin, causing objectionable body and breath odor in people when using garlic as a health supplement. Black garlic has none of the strong odor of white garlic and can be consumed in large quantities without any negative effects like breath odor!